We know what a real nuisance damp and mould can be. Aside from being incredibly unsightly, the unwanted moisture can cause an array of building structural problems, as well as leaving you more susceptible to respiratory infections, asthma and allergies. As most houses have some degree of damp, it may not seem like such a big deal. But we find that all too often, behind those small patches of mould and moisture, there are much bigger issues developing, such as dry rot and woodworm infestation. With this in mind, our team of expert building surveyors have put together a list of the most common causes of damp to help you avoid and eliminate this silent demon. Rising damp occurs when moisture is absorbed from the ground into the walls. Telltale signs include tide marks on walls, peeling wallpaper, decaying skirting boards, fluffy white deposits appearing on plastered walls and black mould. A simple injected damp proof course, whereby holes are drilled into the external walls and filled with a water-repelling substance, would be the best way to eliminate this problem. Condensation tends to occur in humid houses that are not well ventilated. The moisture in the air condensates on cold spots of walls and inevitably causes mould growth. 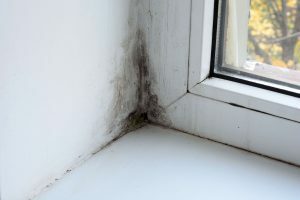 Telltale signs include water collecting on windows, black mould, peeling paint or plaster, mould on clothes or fabrics and an unpleasant, musty smell. To avoid this, try to avoid drying clothing on radiators and clothes maidens inside your home, as this creates an incredibly humid atmosphere. If this isn’t an option, you can help to minimise the effects and release the humid air by opening windows or by using a dehumidifier. This bears many of the same hallmarks as rising damp, however, the point of intrusion is often from an outside wall, leaking pipes, missing tiles or overflowing gutters. With lateral damp, dark damp patches can appear at any point on the wall or ceiling. Wet, crumbly plaster is also a dead giveaway, as well as damaged woodwork and mildew in crevices. As with rising damp, we recommend an injected damp proof course to rectify these issues. Cavity wall tiles with bridges between the inner and outer leaves of the wall. To avoid this, ensure that no mortar is present on the wall tiles. Water ingress in the flashing. To avoid this, ensure that all flashings are in good condition. Damaged bricks or cracks in the mortar can lead to wind-driven rain entering the wall cavity and causing internal damp. To avoid this, ensure that all damaged bricks are repaired or replaced. Cracks within the rendering of a property can allow moisture to enter your property and should be addressed immediately using an acrylic sealant. Broken roof tiles provide a gap to which water can enter a property. In most new houses, there is roof felt under the slates to prevent this from happening, however, in older houses, this may be an issue. If you can see daylight in the roof space then there is a possibility of water ingress. Don’t forget, damp is not exclusive to older properties. New builds are susceptible to unwanted moisture too, so it’s vital to ensure you have a chartered building surveyor survey any property before committing to a deal. Click here to explore our surveying services in more detail. To contact us about a potential project, or for free, impartial advice, give us a call on 01254 77494.